(3) 88001 ran on diesel power from Kidsgrove to Crewe. (4) There has been some debate about the actual route taken from Crewe station to Basford Hall Jn. 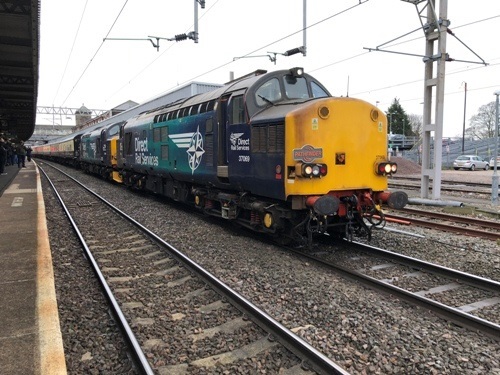 Peter Watts & Paul Warburton have both confirmed that it ran from Crewe platform 12, via the Down Main Salop line, then via the feeder line to Crewe South Yard to the junction with the Up Fast Independent Line at 157.27 by Crewe S.S.N. Signal Box, and then the Up Independent Line to Basford Hall Jn. 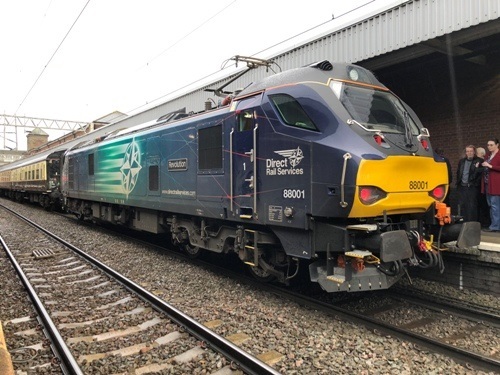 (5) On the return leg an additional stop was made at Rugeley Trent Valley to pick up our relief train crew, that had been stranded on a failed service train. Source : Nick Bartlett (on the tour throughout), Peter Watts, Paul Warburton & Roy Mills.
? Allbrook Jn 05/29 05.30 ~ 05.33 00/12½ 00/08 [DF-DS] ?
? Shawford / Shawford Jn 05/33 05/37 00/08 [DS] 00/04 [DF] ?
? Wallers Ash Loop 05/42 05/46 00/01 23/58 ?
? Worting Jn 05/50 [UF] 05/54 [UF] 23/50 23/50 ?
? Bramley 06/04 06/04 23/36 23/37 ?
? Tilehurst East Jn 06/20½ ? 23/21 [UR] 23/23 [UM-UR] ?
? Didcot East Jn 06/34 [DR] 06/29 [DR] 23/07 [UM] 23/03 [UR-UM] ?
? Didcot North Jn 06/47 06/48 23/00 22/51 ?
? Kennington Jn 06/55 06/54 22/48 22/45 ?
? Reservoir Jn 07/22 07/24 22/00 22/18 ?
? Gibbet Hill Jn 07/59 07/52 21/05 21/50 ?
? Coundon Road LC 08/20 08/19 20/50½ 21/37 ?
? Hawkesbury Lane 08/27 08/24 20/44½ 21/31 ?
? Bedworth 08/31 08/25 20/42½ 21/28 ?
? Chilvers Coton Jn 08/38 08/30 20/38½ 21/20 ? 0.40 Crewe South Yard 19/06 ? 1.02 Crewe Sig.NH43/44 19/12 ?